Home / Adaptation / Food / Hannibal / Reviews / TV / [Review] - Hannibal, Season 3 Episode 7, "Digestivo"
[Review] - Hannibal, Season 3 Episode 7, "Digestivo"
And that, friends, is how you do a series finale. With the consistent exception of Chiyoh, everything that has been at play both for three years and over the past seven episodes came to an emotional and physical climax. It gave us an ending that felt right, did service to all involved, while bringing them to conclusion. It managed what so many other finales cannot avoid, which is spectacle. Because every action on Hannibal is grandiose and over wrought, nothing here screamed Grande Finale. It all just made sense. Perfect, terrible sense. And was a fine note to leave on. Do we have to? Can't we just leave it here and bask in the perfection of it's being. Does the tea cup really need to be reassembled? I mean, I'm game, but after this, I don't know if I want to chance it. Hit the jump for the review, which contains spoilers that always keep their promises. What's interesting about how Bryan Fuller writes this show is that he can be simultaneously overt and subtle about things. In the opening episodes, Hannibal had Lucifer literally superimposed over him. And for the entire run, Hannibal has been the beautiful liar, manipulating things left and right, just to see how people react. The devil imagery has run hot and cold, and so too this season has Hannibal's reveal as a devil in disguise has went from the obvious to the more introspective. It's obviously the characterization that Fuller and his team are working with and towards, and they always find the right balance between beating us over the head with it and letting it simmer in the bottom on the pan. But this episode couldn't avoid putting it all out there. Hannibal, bound and defeated at the center of his spiral of sin, and he is still approached to make a deal. Because even at his most beaten, his most defeated, he's still the one with entirely all the power. Alana making the deal with the devil was shocking to me, perhaps the most shocking thing about the episode. Her motivation all this season has been a sever hate for Hannibal that she's never truly embraced or admitted to, allowing it to cook within her and contort her, like glass left too long in the kiln. She's hunted him, helped to snare him, but when given the chance to follow through, or use him to save Will, she freed the monster to save the man. And she took him at his word that she could trust him, despite there being nothing in their history to back that up. Hannibal is right, he always keeps his word. And his word is usually malicious. I suppose in a way, Hannibal is the most trustworthy character on the show, because when he is genuine, he always tells it straight. 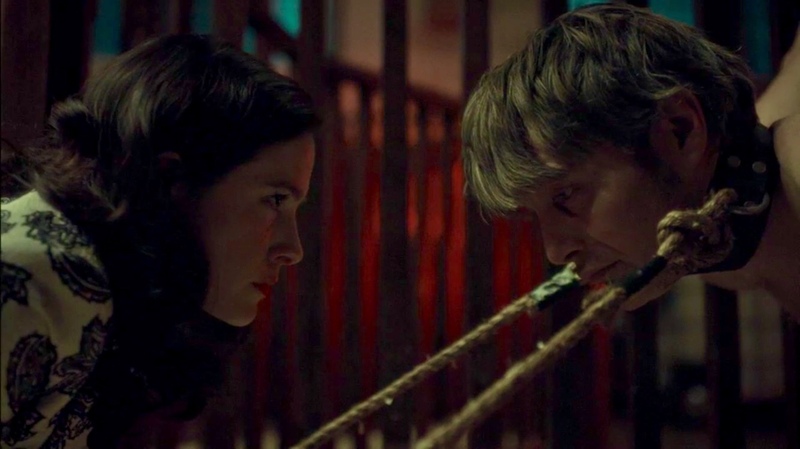 I suppose it speaks to the complexity of the characters and their relationships that Hannibal would agree, for the sake of his former lover that he tried to kill, to save the man she was formerly in love with, whom he's spent a not inconsiderable amount of time attempting to either corrupt or eat. And that his decision to do so is in keeping with his character. In that moment, at that time, he had nothing against Will. It helped that saving him saved himself, I'm sure, but that seems like it was almost a secondary concern of Hannibal's. The Verger storyline faltered only slightly in the end, a symptom of both trying to do too much with too little time (the heir material seemed like it sprinted a great distance in this single episode), and contorting itself to conform with the source. I've championed Fuller's way of freely and loosely adapting the novels, but in this episode it seemed that they were working too much with the template, and felt obliged to make sure that Verger danced his literary steps has completely as possible. Not that his machinations weren't enjoyable, and his fate deserved and unique. But on a show where occurrences like this usually occur with almost a dancer's grace, the steel toed conformity of his demise rang a little hollow. Having read the book, I knew exactly how every beat was going to go, and where it was all going to end up. The greater joy of this series is having no idea how anything is going to happen, even if it happens exactly the way it did before. Like Jack. Last week, I panicked over Jack's fate. I thought he was done for. And this week again, I thought he'd come to his end. the show did a magnificent job bringing us to the edge of his fate, feeling the cold ice of the blade against his neck, and then pulling us back. It has been a roller coaster of survival these past few weeks for Crawford, and I'm glad that he made it through. through enough to accomplish his mission and catch Hannibal, even if Lecter did cheat him out of complete victory by surrendering. And can we linger on those finale two moments for a bit. How heart breaking was that good bye scene. These two men have tried to kill one another a dozen times, but hearing Will say good bye and seeing how much that defeat gutted Hannibal was wrenching. They loved one another, purely. As much as I extol platonic relationships between fictional characters, I would change my tune if more romances were written as intricately as this. This might be the most passionate, genuine affair of the heart ever put to screen. Hannibal turning himself in can be interpreted many different ways. Most obvious to his character is the notion that, if he turns himself in, he's in control of the situation. He does it by his accord, no one elses. Thus he cheats Jack of his true victory. Under that, there is the very Hannibal idea that it keeps him close to Will. Going on the run again means never being able to be near this man who has so encompassed him. If he is locked up, at least he has proximity. But Chiyoh tells him earlier that some animals cannot live in a cage. And Hannibal is too easily bored to resign himself to a simple fate. Except, I think that a spark of humanity exploded and faded inside him when will said good bye. Like his sister, whose death spurred his initial evolution, Hannibal has been transformed by Will. Their years together drew him closer and closer to a measure of humanity. And Will pushed that away. the damage was too greater, and in the end, attempted murders aside, he simple let him go. And I think that broke what little humanity Hannibal had welling up inside. He didn't run because he didn't have it in him. The monster had been quelled, and in that moment, on his knees in Will's drive way he was more heavily chained than he was back at Muskrat Farms. And so, the Lucifer figure becomes Promethean. Which isn't that far a walk actually, when you read the myths together. They both challenged power, and fell because of love. Prometheus, though, throws off his chains, and is never heard from again, while Lucifer remains bound in the pit of his own treachery. Six episodes left, let's see which Hannibal takes after, shall we?